Dubai: In a sea of darkness for the retail industry, tech company Apple is often seen as a shining beacon of hope. The company consistently ranks number one in sales per square foot, making Apple stores the most valuable retail spaces on earth. The spaces are futuristic and expansive, often employing large glass windows and trees to create a relationship with its customers, and to build brand recognition. In essence, Apple redefined what a shop could, and should, look like. Now, Apple has revealed its latest ploy to maintain its dominance in a world of slumping retail sales and store closures: It plans to turn its physical spaces into free, creative classrooms. On Tuesday, the California-based company, one of the most valuable in the world, announced a revamped slate of public programming that it said would be rolling out globally from January 31, 2019, dubbed ‘Today At Apple’. Spearheaded by Angela Ahrendts, the former Burberry chief executive that Apple poached in 2014 to be its senior vice president of retail, the programme will offer classes on photography, video, music, coding, art and design, and health and fitness. The lessons will be available for free at every Apple store around the world. 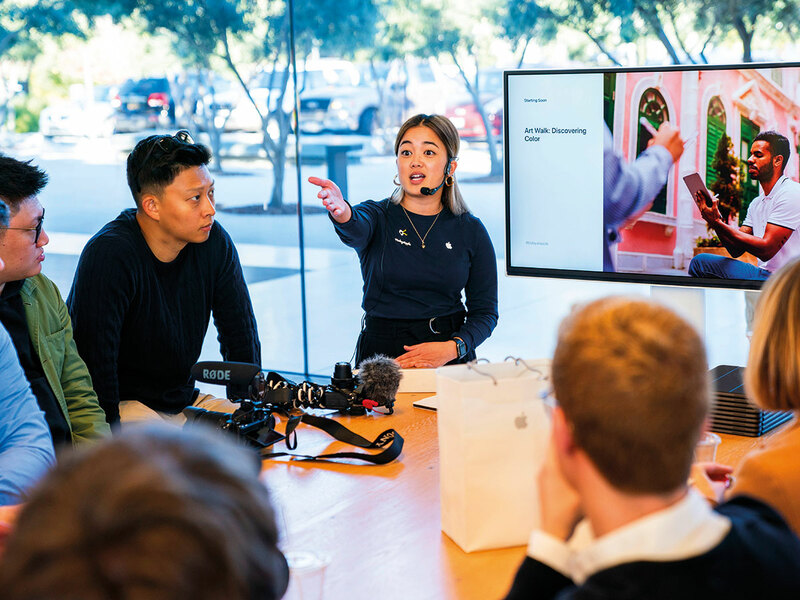 Transforming its stores into schools forms part of the strategy Ahrendts was hired to craft: In 2017, she announced that Apple stores would become “town squares,” places where people could go to hang out, use the free WiFi, and get hands-on with Apple’s products. Credited with reinventing Burberry’s physical presence and appealing to a new generation of customers, Ahrendts espouses a vision of retail that many experts say will be essential to survive in the future: It is not enough to simply focus on online shopping, or your bricks-and-mortar presence. “You have to put it all together: one customer, one brand,” she said. But that vision has not been without its obstacles. Part of its “town squares” roadmap, Apple’s strategy of opening stores in highly visible public places, such as Covent Garden in London, or Fifth Avenue in New York, or the Apple Piazza Liberty in Milan, has led to controversy elsewhere. In Stockholm, Sweden, the government blocked Apple from opening a new store in one of the capital city’s most popular public parks, the Kungstradgården (King’s Garden). Elsewhere, Apple was met with fierce criticism in Melbourne, Australia, when it announced plans to move into Federation Square, the city’s main public gathering space that is also home to a number of its cultural institutions. Delayed negotiations between the government and Apple over the store are still ongoing. Asked how the company countenanced its self-proclaimed “responsibility to enrich public life” with the backlash it had received from a number of cities over its colonisation of public places, Ahrendts was blunt. “In Stockholm, there is already a TGI Fridays where we were going to put a store,” she said, adding that Apple stores were increasingly used as gathering places, which would ultimately benefit the local economy. “Most mall developers will tell you that we have four to five times the traffic. We help the mall, because people are coming” Ahrendts said. In San Francisco, the company said it worked with the mayor’s office to landscape the plaza outside its flagship Apple store in Union Square, one of the city’s most visited public places. “There was a fountain there, that nobody had touched forever, we said ‘we’ll renovate the fountain, we will invest in the town square, we’ll put WiFi free 24/7’,” Ahrendts said. “We do not own it, we don’t control it, but why shouldn’t Apple do incredible civic gestures like that?” she added. Critics say that the job of renovating public spaces should not fall to one of the richest companies in the world, but to the local government, and the current co-opting of historical buildings by Apple sets a dangerous precedent. The Carnegie Library in the US capital of Washington DC perhaps best encapsulates this debate. A famous cultural landmark, the library has largely stood empty since the 1970s. While some object to a commercial organisation entering a historic building, Apple maintains that not just trying to sell gadgets, but it is trying to offer services of public interest. “Here’s this library sitting here that no one is doing anything with, it’s this icon,” she said. Children learning how to code, grandparents learning how to take better photos on their iPhones; Apple’s public programming will ultimately heap more recognition on the company as a brand, even if it doesn’t directly generate sales. Even if a customer who sees something in one of Apple’s iconic stores then proceeds to order it online, the end result is that Apple profits. “[A programme like] Today At Apple encourages them to come more. It encourages them to gather.” And that is exactly how Ahrendts sees the future of retail.